1) Get big flowers. Like REALLY big flowers. The larger the flowerhead, the fewer stems you need and the less money you will spend! 2) Avoid the expense of in-demand blooms by staying away from flowers altogether. Instead, focus on creating texture with boho woodsy ferns, and sylvan table arrangements including moss. 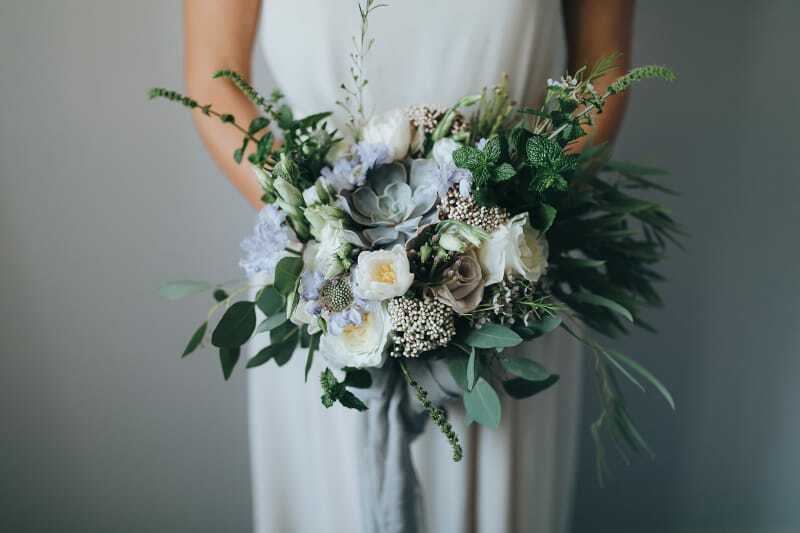 3) Be the trendsetter bride and instead of full bouquets, give your bridesmaids corsages to wear on their wrists or boutonnieries to fix onto a neckline or waistband. It will leave their hands free (to fluff out your dress, if need be) and provide the perfect accessory for their outfits. 4) Use flowers as your focal points. Positioning some at the bar and on the central table will draw the eye and let you get away with much smaller pieces on the other tables. This will make the room seem full to the brim with decoration, when actually there’s a lot of space. 5) Instead of having bunches of flowers on each table, try putting single stems in elegant and tall vases. Because of the impressive height, the room still looks decorated throughout, but this way you use fewer stems and your guests will be able to truly appreciate the flowers you’ve chosen. 6) Having a literature or music themed wedding? Have your flowers made from paper, with pages from your favourite books or the scores of the songs in your wedding playlist! 7) Double your flowers as wedding favours. Use potted flowers that will add quirkiness to your table settings and will make wonderful gifts for your guests! 8) The same logic for food applies to flowers: seasonality. Peonies, when not in season, can be four times more expensive than roses, this includes cabbage roses that look almost exactly the same! 9) Does your wedding venue have some wonderful flowers, all their own? Use them! It will mean so much less work for everyone involved and so much saved money for you.